Structural or roll formed one? 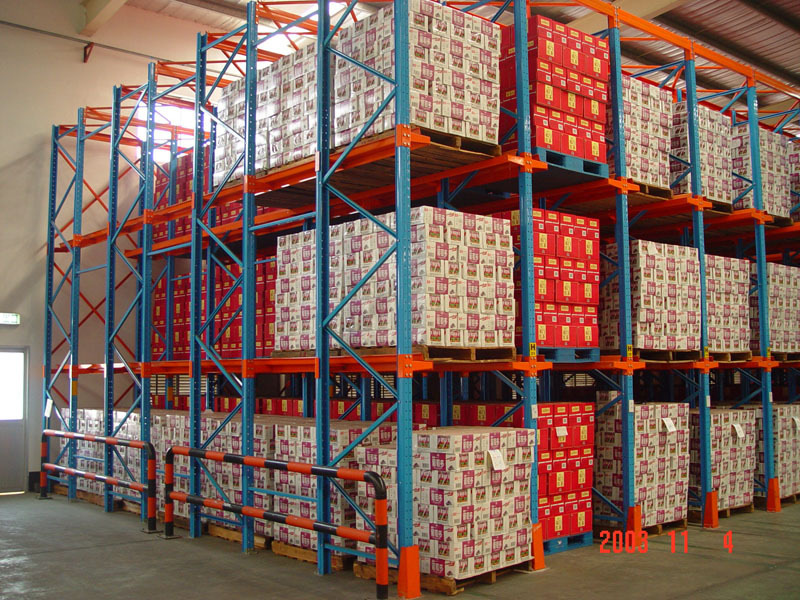 Drive in Pallet racking system is one storage system which have high storage efficiency. The structure of derive in racking is different from other racking. The post structure mainly take side and vertical strength. All pallets are put on the suport arm rail which connect with post. Most high density drive- in pallet racking systems are little more than conventional pallet racks, adapted and reinforced to meet the stringent demands of drive-in applications. T Racking’s drive-in racking system provides the space efficiency and high volume storage of block stacking, with easy access to pallets. There are no aisles and no cross beams, providing maximum space efficiency. And because each pallet sits on its own support rails, pallets are no longer stacked on top of each other. • Drive-in racking is tailored to pallet and load size and handling equipment. • Can be used with standard handling equipment. • Rails adjustable optimize space utilization. What’s Drive In Racking Structure Detail? Top Bracing: X style bracing on top of each bay, connect by turn buckle or bults & nuts. Post Protector: to protect forklift from damage the post, this is very important component for drive in racking safety. Floor Guide Rai: this rail is to guide the forklift driver to move safely in the racking system. It can stop forklift wheels before hit the racking system. This is additional component but we suggest it used in each drive in racking and drive through racking project. 1. It provides greater pallet storage. 2. It also provides you with an unlimited depth of storage. 3. It has limited aisles and thus, it is more efficient in space management. 4. With the help of the set-back or cant-leg designs, it can be useful in preventing forklift damage. 5. It provides a denser arrangement of your stored products. 6. It can be custom designed for your forklifts and pallets. 7. It is actually an affordable storage system. 8. It can be used with push back pallet racking in order to build a combination system. Structural or roll form drive-in racking: which one is better? Roll form drive-in the rack has a boltless design and also very light in weight. It is designed for light storage. Whereas on the other hand, the structural drive-in rack is used for heavier goods. It is preferred for loads heavier than 1500 kg. it is made of hot rolled c-channel steel. It is also designed with bolts and nuts which makes it stronger and heavier to handle heavier loads. It can also resist more impact than roll form drive-in rack. Structural cracks are heavy and thick because of which they are preferred for heavier loads. Their heavy structural design is what makes them more resistant to impact. It can easily resist the impact of forklifts exiting and entering the racks. When and where to use Structural drive-in racks? You should make use of structural drive-in racks when you have to store heavier loads that are more than 1500kg per pallet. when storing bulky and heavier items like pipe, plywood, bar stock, coils and steel sheets etc., structural drive-in racks is the best option for you. It takes longer to install a structural drive-in rack than roll formed drive in racks. This will affect the total cost of installation significantly, as the installation cost for will base on labor cost to complete the job. Whereas on the other hand, roll form drive-in racks are lighter in weight and don’t use bolts and nuts, thus it can be installed much faster. Not only that, but due to its bolt-less connection, it is easy to connect the arms to the uprights. When handling drive-in rack systems, it is important to maintain safety measures. Training for Forklift operators: It is important that all forklift operators are trained as per the mentioned guidelines. However, the operators should be provided with additional training in unloading and loading the goods in the drive-in pallet racking. One should know that the insides of the racking is not visible and therefore, you need to be slow and precise with your operation so that there is no impact between the racking and the forklift. Regular inspections of the drive-in racking are also important in order to identify any damage. Every impact or hit affects the structure of the steel racking and its storage capacity. Damaged racking should be replaced immediately in order to avoid any accidents at the site. You can also make use of column protectors as a form of preventive measure. Pallets that are used in drive-in racking should have a consistent size and also made of quality materials as well. This is important because of the precise dimensions of the racking system. Quality materials ensure that the racking system lasts longer and can support more goods. These two are the most important factors that determine the overall quality and capacity of the pallets. 2. Safe unloading: Even safe unloading is important. Drive-in racks can be deep and therefore, forklifts operators may not be able to take care when reversing out of the storage system. Speed may be the main priority for most operations but then safety is also important. Any collision with an upright frame while working under the system is extremely unsafe. Therefore, it is important to follow all safety measures. You should avoid colliding with the upright frame while unloading the goods. 3. Maintenance: It is important that you keep your drive-in racks in good and stable condition. It is true that the drive-in racking system requires very less maintenance but it is highly recommended that you run regular safety checks in order to confirm that there is no damage. This is crucial for the safety of the operators and your goods as well. While checking for damage focus on loose anchors, damaged pallet rails and frames, and always report and replace the damage one if any. 4. Especially for the cold store, most cold store use drive in racking to have maximum storage capacity, as the investment or rent for cold store is very huge. Client wish to have any many pallet as possible to share the high cost. The condition of cold store is much complex than normal dry store. The humidity of air would be very high for cold store and fresh store, also the temperature will be very low. For some frozen store, the temperature will be even lower than minus 20 degree. In this way regular inspection is quite necessary. It would be good if warehouse manager could have a inspection for the cold store every 3 months and report issues of system if found any. Overall, it can be concluded that the drive-in racking system is one of the best types of storage system that you can use in your warehouse. It not only provides you with easy storage but it is efficient in utilizing space as well. We only choose quality steel material from world class steel factory to ensure product quality. Our drive in racking system designed comply with most strictly industry standard like Australia AS4084-2012, F.E.M and SEMA standard. The product warranty can be as long as 5 years. A mill certificate with stamp of steel factory can be offer for each shipment. With the help of advanced automatic machine, we can delivery drive in racking project in time according to your installation schedule. No matter your project is 30 pallets or 10,000 pallets, No order will be too small or too big for us to fulfill. Contact us today to get professional advice for your warehouse storage. 1.I see many racking and shelving suppliers. How do I know who is telling the truth and which are trustworthy to work with? There is only one chance to gain your good first impression. But Our business principle is excellent quality & competitive price & best service. That’s the only reason help us survive in the fierce market and drive old customer to repeat orders and recommend us to their friends. 2.Which element I need to offer to get layout design for the project? 3 .What’s the rough cost for drive in racking project? 4.How much would it cost to get a complete drive in racking project done? The total cost would includes project cost + shipping cost + installation cost, please contact with our sales department to get accurate quotation for project cost and shipping cost to your nearest port. 5.What’s the standard lead time for the drive in racking project?. 4 weeks after order confirm is our standard delivery time for project less than 2000 pallets, for large project and urgently inquiry, the lead time can be negotiable. 6.Do you offer installation for the project? Usually we don’t offer installation job for the project, as the flight and accommodation cost will be very high from us to send complete assemble team from China. We can recommend 3rd party assemble team in your city or nearest area. 7.Can I choose the color of project? 8.Can I combine Drive In with other rack systems, such as pallet flow or push-back? 9 : .What’s the warranty time of your products? We offer 5 year warranty for all of our racking product, includes drive in racks. 10.I don’t know which forklift to use for the project, can you help? Yes surely. We have dealer agreement with the leading forklift supplier in China like He Li and Hang Cha, we can supply you forklift , as well as other handling equipment like pallet truck also if you want get complete project from us.